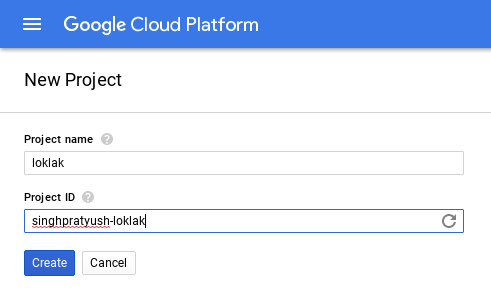 Follow these 10 steps to get an instance of loklak running on Google Cloud platform using Kubernetes. Note: The document uses predefined names for various properties like project ID and docker image name to avoid confusion. You may want to change them when needed. Visit https://cloud.google.com/free/ and follow on-screen instructions to create an account and get the free trial. Create a new project with desired name and ID. Go to https://console.cloud.google.com/kubernetes/list and wait for the container engine to get ready. You may need to select the project from the project section in the top-left corner. In the top-right panel, click the shell button. You’ll be greeted by an online console. $ docker build -t gcr.io/singhpratyush-loklak/loklak:v1 . This makes our cloud registry ready. Let us create a Kubernetes cluster where we can deploy this. gcloud provides easy to use interface for creating clusters. Let us take a look at the properties that we can configure while creating a cluster. This will take a few minutes to complete. After done, you can see a new cluster active on your console. On a browser, visit the deployment using the external IP (http://104.154.24.48/ in this case).